HONOLULU, Hawaii, Sep 3 2016 (IPS) - A dramatic decline in Africa’s savanna elephant populations caused by poaching – as exposed by the results of a three-year aerial survey released this week – has piled pressure on reluctant governments to back proposals that would lead to bans on domestic trade in ivory. The United States and Gabon, plus nine NGOs, are co-sponsoring a motion at the IUCN World Conservation Congress underway in Honolulu that would push all governments to extend an existing international ban on the ivory trade to their own domestic markets. But several rich nations, as well as some African countries, are opposed to the measure which could prove to be among the most hotly disputed of some 100 motions to be voted on by the 1,300 members of the International Union for Conservation of Nature who hold a congress every four years. A vote is scheduled to take place on Sep. 7, although it is possible that negotiators could first reach agreement on a revised text. 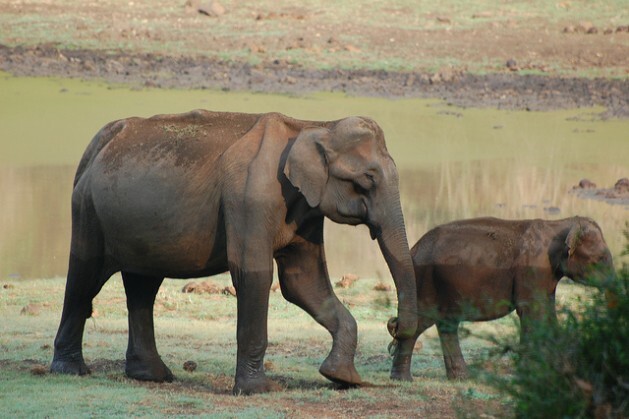 Susan Lieberman, vice president of international policy for Wildlife Conservation Society, a co-sponsor of the motion, told IPS she expected a close vote, but that the shocking results of the Great Elephant Census (GEC) could tip the balance. “The GEC puts pressure on governments. It shows this is not the time to wring your hands but the time to take action,” she said. Statistical analysis of the census findings showed that savanna elephant populations in 15 countries had declined by an average of 30 percent – equal to some 144,000 elephants – between 2007 and 2014. The aerial survey, carried out by spotters in low-flying planes, spanned nearly 350,000 square miles in 18 countries. The data, after statistical analysis, came up with a count of 352,271 elephants. Comparative data only existed for 15 countries. The spotters also counted carcasses that helped compile estimates on the percentage of illegally killed elephants. Forest elephants, more difficult to spot by air, are to have a separate census. The sharpest declines were seen in Tanzania and northern Mozambique, while some areas showed slight increases or a stable population, including South Africa and parts of Zambia, Zimbabwe, Malawi and Kenya. Relatively high carcass ratios in Uganda and the W-Arli-Pendjari conservation complex spanning Benin, Niger and Burkina Faso suggested that numbers there had been swelled by elephants moving in from surrounding areas. Mike Chase, founder of Elephants without Borders, was the principal investigator for the census which was funded at a cost of 7 million dollars and by Vulcan Inc, created by Paul Allen, billionaire philanthropist and co-founder of Microsoft. “Armed with this knowledge of dramatically declining elephant populations, we share a collective responsibility to take action and we must all work to ensure the preservation of this iconic species,” Allen said in a statement on Aug. 31 accompanying the release of the census at the start of the 10-day IUCN congress. Tony Banbury, Vulcan Inc’s chief philanthropy officer, told a press conference on Sep. 2 that it was highly important that motion 007 seeking a ban on domestic trade was passed with broad support. The U.S. has paved the way by imposing its own ban on domestic trade in ivory in June. China, the biggest consumer of illegally smuggled ivory, has pledged to stop its domestic trade. Its prohibition is not yet in force but the announcement had the effect of sharply reducing market prices. However, according to James Deutsch, Vulcan Wildlife Conservation director, “many countries in the EU are sitting on the fence” over the issue. He mentioned the powerful lobbying of the fine arts and antiquities sectors, even though ivory more than 100 years old would be exempt, singling out the UK. France is among those backing the proposed ban. A vote by IUCN members to stop domestic trade in ivory would not be legally binding. However, as noted by Lieberman of the Wildlife Conservation Society, such a move by the world’s leading conservation movement would in turn pile pressure on governments to back a similar resolution at the triennial meeting of CITES, the Convention on International Trade in Endangered Species, to be held in Johannesburg later this month. There is debate over whether CITES, which regulates international trade in certain threatened animal species, can use its remit to ban domestic trade, but a vote to that effect would be seen as highly influential if not binding. Lieberman said Japan was known to be against the motion at IUCN, as were Namibia and South Africa, while other African nations had appealed for help in imposing bans. Brian Child, a South African professor at the University of Florida, interjected during Vulcan Inc’s press conference to protest that a ban on his country’s domestic and controlled trade of ivory would be a “breach of sovereignty” that penalised South Africa for what he said was its good husbandry of elephants. Turning to Europe, Lieberman said Germany wanted the issue of the domestic ban raised not at IUCN but at CITES, while the position of the UK was unclear. The EU votes as a bloc at CITES but member states vote separately at the IUCN. The UK had not even sent a representative to the IUCN congress, apparently as a result of confusion over funding following the referendum decision to quit the European Union, she added. “It is inconsistent that the UK is not showing leadership on this,” Lieberman said. However, she added, Prince William, a patron of the Royal Foundation which puts conservation among its top priorities, was known to be against the domestic trade in ivory while the royal family had withdrawn its extensive collection of ivory objects from public display.